Posted on July 4, 2013 by M.E. The Scandal star up and married NFL player Nnamdi Asomugha last month in a super-secret ceremony witnessed only by their nearest and dearest, E! News exclusively confirmed. Now we know E! can report some bogus stories, case in point confirming a 2nd pregnancy for Beyonce; which was clearly false. However, E! has obtained the marriage certificate. 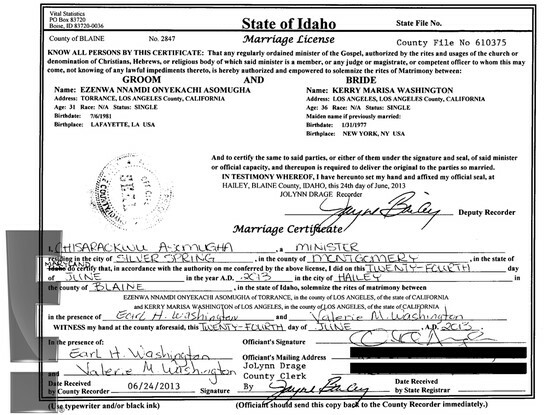 According to the newlyweds’ marriage certificate, exclusively obtained Wednesday by E! 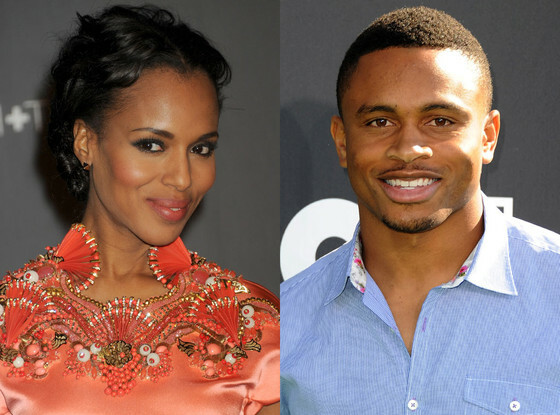 News from Idaho’s office of Vital Statistics, Ezenwa Nnamdi Asomugha swapped vows with Kerry Marisa Washington on June 24 in Hailey, Idaho. Washington’s parents, Earl and Valerie, signed the certificate as witnesses, and the groom’s sister, Chisaraokwu Asomugha—a minister in Silver Spring, Md.—officiated.